← 0064 Interview 004 With Grenades!? Can Ron Paul Slay the Beast? Have you ever heard the story of Saint George and the dragon? There are lots of variations of the story and it has been used through the ages to teach many different lessons. But I think it carries a lesson for us today. Have a look and see if you agree. One version of the story is set in the city of Lasia. There was a large pond in the center of the city that became inhabited by a plague-bearing dragon. When hungered, he would arise and infect the countryside as he sought sustenance. To appease the dragon, the people of Lasia began to feed the dragon a lamb every day. But the appetite of the dragon grew and was such that he could not be satisfied with only one lamb. So he demanded more and more until the shepherd’s flocks failed and there were no more sheep. Then the dragon demanded that the people bring him their children. Filled with terror, the people of Lasia fed their children to the dragon, one a day chosen by lottery. Then it happened that the lot fell on the king’s daughter, Sabra. The child princess was sent to the pond, decked out as a bride in a golden girdle, to be fed to the dragon. It was on this very day Saint George, by chance, rode through the city and past the pond. The princess, trembling, asked him to go away so as not to anger the dragon, but Saint George vowed to remain. At that moment the dragon rose from the lake, so Saint George fortified by the Sign of the Cross, spurred his charger, drew his lance and gave the dragon a grievous wound. Then he called to the princess to throw him her girdle, which he placed around the dragon’s neck. With the golden girdle in place, the dragon followed the girl like a well trained dog on a leash. Saint George and the child princess led the dragon through the streets of the city, where it terrified the people at its approach. But Saint George called out to them, and comforted them that the dragon was harmless as long as the golden girdle was around the beast’s throat. Eventually Saint George slew the dragon to the delight of all of Lasia. I have another story. It may seem similar, but hear me out. There was once a great land called Independence and through it ran a river named Potomac. This river became inhabited by a small dragon and it enticed the people of Independence with sweet words of assurance that they wound be safe from all enemies and great prosperity would come to the land, if only they would feed the little dragon a small offering of their vast wealth. Things went well to begin with but slowly there were changes taking place. With almost no one noticing at first, the dragon began consuming more and more and as he did so he grew larger and meaner. Then one day someone realized that the land was no longer referred to as Independence, but had been renamed Dependence. The Dragon, who in past times was only seen in the waters of the Potomac, now roamed the land, sticking his head into shops and storehouses, going through the pockets of travelers, taking whatever pleased him and gobbling down every morsel of food he came across while handling children in unspeakable ways. It was at this point the people first realized that the dragon had grown too powerful for them to control so they confronted the dragon and demanded he shrink himself back to his former size. The dragon simply breathed his enchantments upon them and whispered into their minds that without the dragon their enemies would enslave them. The narcotic breath of the dragon seduced the people and they quietly went back to their work of producing wealth and food for the dragon. The appetite of the dragon grew and eventually he demanded a kind of lottery that he called a “draft” where randomly chosen young men would be fed to the beast. He assured them that the lottery wasn’t permanent; it was only in times of an emergency when there was no other way, so the people, stupefied by the dragon’s breath, complied. Countless thousands of young men were fed to the beast over the years and each time the people began to complain, the dragon would suspend the draft for a while. One day Saint Paul rode into the land on a powerful charger named Liberty with his lance gleaming in the sun. The old dragon tried to ignore Saint Paul at first but eventually it turned on him and attacked. Liberty sprang into action and Saint Paul drove his lance deep in the dragon’s belly. Then Saint Paul wrapped a rope of gold around the beast’s throat and the dragon became as harmless as kitten. The spell of the dragon’s breath was broken and the people marveled at how Saint Paul could control the huge beast with only a tug at the golden rope. Right away the dragon began to shrink and it continued until it was back to the size it was when it first arrived at the banks of the Potomac, so long ago. But now the story turns, because its fullness has yet to be told. You see, some people like the small dragon and see it as harmless, while others can’t remember what happened in the days that their minds were fogged by the dragon’s spell. Some see the utility of the dragon and would seek to use it for good. All the while a small radical few cry out for the beast to be killed! But no one pays much attention to them anymore. 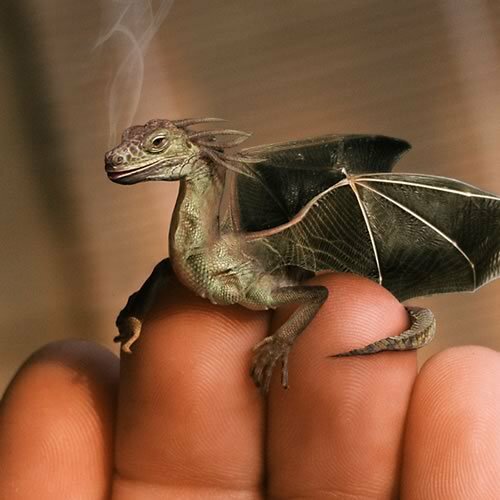 After all, one look at this little dragon and you can see it’s no longer dangerous. I first learned of Ron Paul in the summer of 1988. Earlier that year I had been a stand-in delegate to the California Republican Convention and in frustration of the direction the party was headed I had torn up my membership card and thrown it in the trash. Although I had been involved with libertarian causes a decade earlier, I had naively been convinced by the Reagan hype that our best chance at liberty was through the Republicans. When a more radical libertarian friend told me about Ron Paul I thought the news was too good to believe. A gentle doctor, a quiet intellectual had been given the Libertarian Party’s nomination. I learned everything I could about this humble man and was please to vote for him in the fall election of 1988. My friends and family told me I was “throwing away” my vote. I responded that I had thrown away my vote for 8 years when I supported the Reagan Revolution. Now at last, I could vote without compromise. Lately I’ve been asked if I support Ron Paul for the office of president of the United States in the election of 2012. I do and I do not. Assuming Ron Paul can win the Republican nomination, lets examine some possible directions the future could take, and then we can judge for good or for bad. Remember, I’m being brutally honest here so be warned, this may get rough. Those among us who tend to lean toward conspiracy theories; can we believe the powers-that-be will allow Ron Paul to make it to a general election alive? As a child who grew up in the 1960’s I remember what the current generation has been spared. However, twenty first century America is not immune to the assassin’s cloak and dagger, although a more modern method may be employed than the crude killers that punctuated my childhood memories. So then, can I support this gentle doctor if I know my support pushes him to a martyr’s finish? Before I answer, let me add a thought or two. If this unthinkable evil were to befall us, how would the liberty movement react? There are two possible answers to that question. They can react peacefully in respect for a peaceful man. Or they could react with violence and add a worse tragedy to an already bad situation. In the case of a violent reaction, the State would be empowered like never before and America would see more totalitarianism than can be imagined. This is because the State knows exactly how to respond to violence, as the State is the very pinnacle of violence. What if the paranoia is unnecessary? What if Ron Paul could go all the way to the general election? What if the people of America stood up for liberty and Ron Paul won the election of 2012? What if Ron Paul could wrap the rope of gold around the throat of the Beast and bring it into submission? What if markets were set free of the burden of the State? Peace would win the day and the path of prosperity would be beneath our feet once again! The most selfish desires within me dream of this future. That I could live to see such a day would almost be more than I dare ask for. However, it is in pure selfishness that I dream of this future because I know that what this future actually brings is a delay of the inevitable. The Beast I speak of so often is larger than this one dragon on the Potomac. It’s older than the oldest nation and more evil than a single human mind can comprehend. It was birthed deep in the soul of mankind in the misty distance beyond Avalon and Eden. It has risen and it has fallen and it has risen yet again, and it will continue to do so until it reaches its fullness. One man or one generation of man can only delay the inevitable maturity of this Beast, but until humankind can behold the hideous Monster in its adult form humans will never completely reject the State as their god. Is Ron Paul the best choice for president of the United States of America in 2012? Would I be thrilled to see Ron Paul elected as president? But I’m a selfish old man. For humanity’s sake, Ron Paul serves us better by speaking and writing than by holding the leash of the Beast that will devour some future generation. This entry was posted in Audio Articles, Bad Quaker Theology, Economics, Free Society, History and tagged Avalon, Beast, dragon, eden, election 2012, free market, freedom, gold, gold standard, golden girdle, golden rope, Libertarian party, liberty, peace, Reagan Revolution, reject the State, Republican party, Ron Paul, Ron Paul 1988, Ron Paul 2012, Ronald Reagan, Saint George and the dragon, Saint Paul and the dragon, St George and the Dragon, St Paul and the dragon, state as god, yellow brick road. Bookmark the permalink.